What’s more fun than a barfing child? …has a fetus in it. I don’t really understand why going to church causes me to feel panicky and anxious. It doesn’t always — just lots of the time. Seems to come in waves, I guess. Did I mention there’s this inner voice yelling for me to get out? Yeah. I find myself gritting my teeth to keep from echoing it with “I GOTTA GET OUTTA HERE!” — like that lady in the movie Airplane! I left early today, as I generally do when the Voice and the teeth-grinding and the jaw-clenching and the sweats start to build, and once I’m home I calm down quickly. I’m not afraid of socializing at these times, and there’s nothing spiritual or anti-spiritual going on — though I should add it’s difficult to feel the Spirit when your mind is frenzied. It basically comes down to this: The Church is true, and sometimes I can’t bear to go. And what’s with pews, anyway? Why must sacrament meeting be UNCOMFORTABLE? I believe we’re probably supposed to focus on spiritual things rather than physical, but how do you focus on the spiritual when your body is clamoring for your attention? I have a prescription I’m supposed to take when I get panicky, but I haven’t found it helps much. Sitting still has really never been my fortÃ©, I realize. In college I could just get up and leave when the attacks began; in the MTC it was torture. TORTURE. It doesn’t “get better” when you force yourself through it. It just builds until you finally get to escape. I told my MTC teacher once that if a person could make it through the MTC, they could do anything. But later I learned that plenty of missionaries liked the MTC. To this day the MTC ranks as the second-worst time of my life, ranking above when Mom died, and when Dad died two year later. On my way to work today I began to suspense something frightening: that I was picking up a Utah accent. I realized that when I say the word “mountain”, my T is so soft that it’s essentially non-existent. This flashed me back (and having flashbacks while driving isn’t something I recommend) to one of my first jobs after my mission, as I was taking notes from my boss, and heard her say “mountain” with a thick Utah accent. It sounds like “mow-uhn” (“mow” with an “ow” sound, not an “oh” sound). Mow-uhn. Sounded ridiculous. I’m not that far, I realized, but my T was on its way out. I thought I’d always spoken like this, but it couldn’t be right, could it? My pronunciation is closer to “moun-nnn”, with a T that starts but never finishes. So I started googling, trying to figure out what the proper pronunciation of the word “mountain” is — or at least the common pronunciation in U.S. English. Took me a few tries, but I came up with this link, which says that the soft T in cases like this is common usage in all the U.S., except perhaps by broadcast journalists. I was relieved, as you can imagine. I (unconsciously) consider all accents a sign of poor education, and loathed the thought of sounding that way to others. I would love to teach an “American Accents” class to all the Spanish-speakers I know. Spanish has no laziness in it — each vowel has one vowel sound, and they don’t drop down into the American “uh” sound ever. I learned this in Argentina. When we make an O sound, for instance, our lips start wide and open, but close around the sound. Saying it in slow motion, you’ll hear “Oh-ooh”. If you cut yourself short saying “Oh”, you can hear the difference. And it sounds like a Spanish accent. We need to teach them that English is often lazier than they are used to, so while the pronunciation guide says “moun‘ tÉ™n”, that T is almost unheard. And the vowels all slide down to “uh”. Eh? Eh? 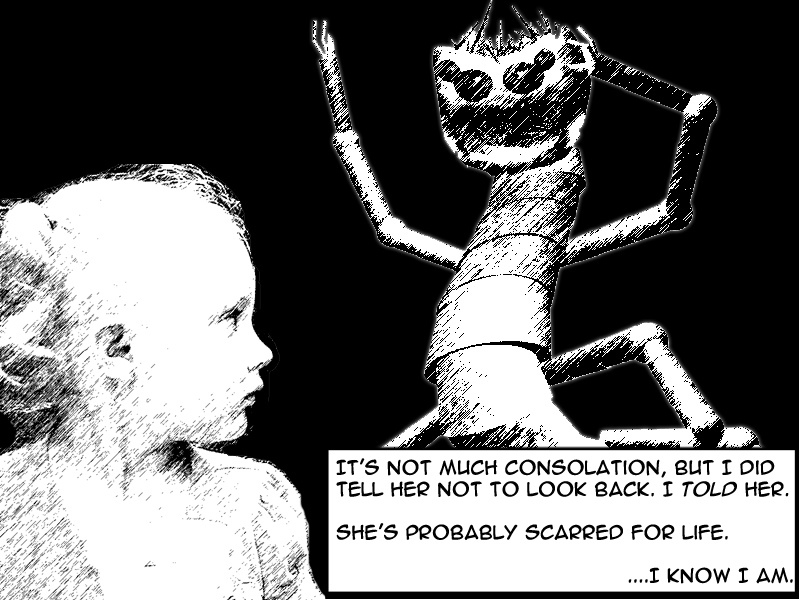 There’s my little girl, turning to see a hideous alien bug monster I rendered in Blender. Isn’t it neat-o? Graphic novel without an artist! Idea #3764: Do a graphic novel using photographs that have been photoshopped to look like artwork. Use 3D-models I do in Blender to create anything we need for backgrounds or alien characters. They’re reusable, poseable and such, and easy to match up with the lighting from photographs. New Improv Game. Or Maybe Not. Is there a game called “Good News Bad News”? Or something like that? Where either the ref calls out what news a character has to share, or else the players just have to progressively give better and better good news while still giving worse and worse bad news? That should be a game. Might end up being too talky, no doing-stuff-ey. The rules would have to be first thing said is Good News, last thing said is Bad News. You could do actions as you talk, or in between. Maybe this game already exists. “Having a mathcident” — making a mathematical error. That means I’m great. BOW BEFORE ME, WORLD! I MAKE UP WORDS THAT ARE GOOD!